Famed master knife maker Gil Hibben has added another custom design to his annual Fantasy Series collection with the Dragon"s Lair sword! This special autographed edition is strictly limited to 3,000 pieces. It measures 38 1/8" overall and features a double edge 21 1/4" blade constructed from solid 440 stainless steel. The blade offers an impeccable mirror finish and heavy blood groove down the center. The guard, pommel, and blade collar are solid cast metal construction with a mirror silver finish. The handle is wrapped in custom genuine blue leather for a superb grip. This item includes a custom black leather sheath personally autographed by Gil Hibben. The quality of the sword and sheath arrived without a blemish. Just as it was described. It is beautiful!. This is by far the best sword I have ever bought. It is totally worth the money I put into and even more. Highly Recommend that anyone should by this. 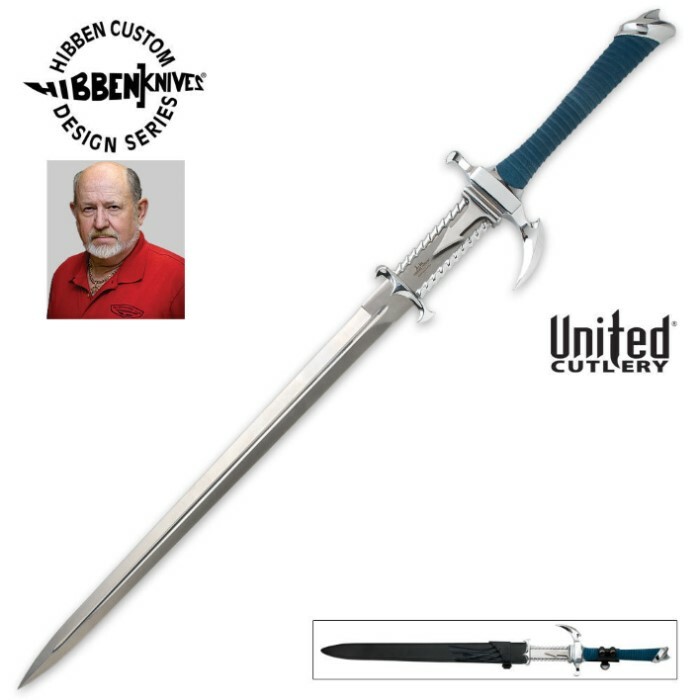 Awesome Sword Gil Hibben! Clint Kadel is the best. All products that I've bought from Clint's BudK never fail to Impress me. Keep it up BudK. Very good looking sword. Nice addition to any collection. Outstanding customer service. Very nice sword. Feels well balanced and looks amazing. Only minor complaint I have is, the material they used on the handle doesn't seem to be that secure, after handling mine a few times, it started to come unwrapped. No big deal really, a little glue and it's fine. But scary when it's brand new. purely for fantasy, although, if given a sharpening, this sword can probably hack down or through more than a few trees. it has a nice weight to it and is pretty big (don't let the pic fool you). it definitely has brought me back to seeing Dirk the Daring in his adventures. Great Blade. Looks awesome on my wall.